Fundación Organizmo creates sustainable structures out of recycled PET plastic bottles, through a technique known as "Ecoladrillo", Spanish for "Ecobrick." By filling plastic bottles with sand, and molding them together with mud or cement, the walls created are durable and will maintain a comfortable indoor temperature of approx. 64 degrees in the summer time. To build a two bedroom, 1,200 square-foot home, about 14,000 bottles are required. 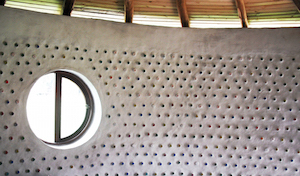 Given the ubiquity of used plastic bottles and mortar materials - such as mud and cement - the Ecoladrillo building technique can be adopted as a low-cost and sustainable solution to the shortage of adequate shelter and housing around the world.